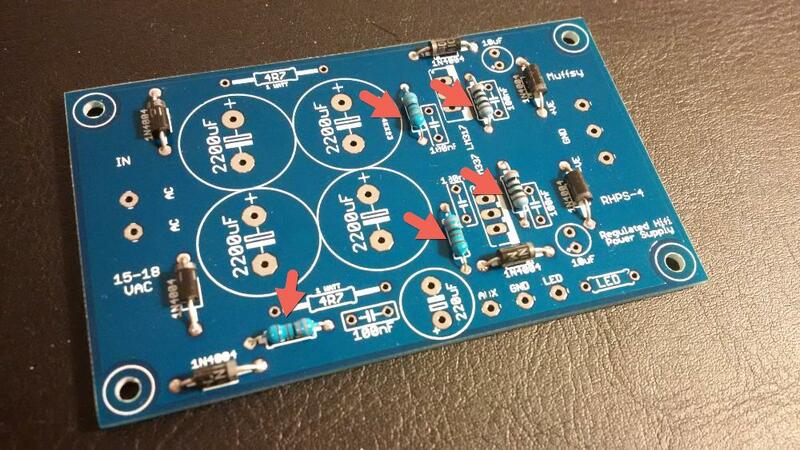 Please note that the Muffsy Hifi Dual Power Supply is delivered as a printed circuit board only. You need to buy the components listed in the bill of materials below. 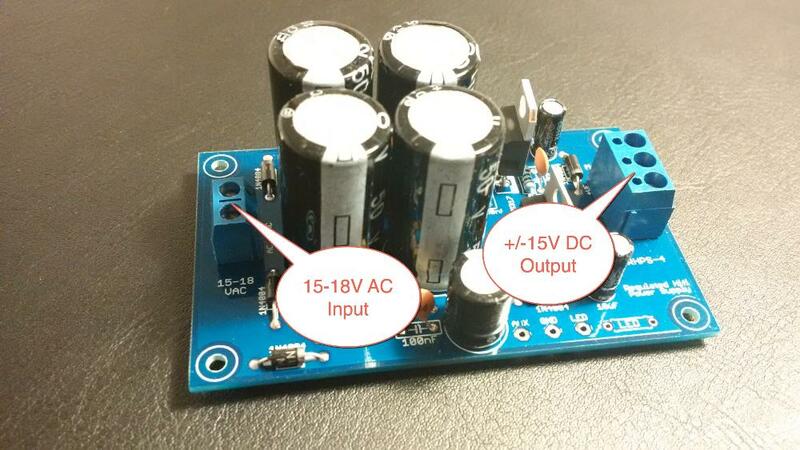 A 15-18 volts AC wall adapter is needed to make this power supply work. Here is some more information about what you need to build the Muffsy Phono Preamp and Power supply. *) It's hard to give a good suggestion of a power jack, as this will depend on your requirements. Please note that a power jack is included with the Muffsy Back Panel. 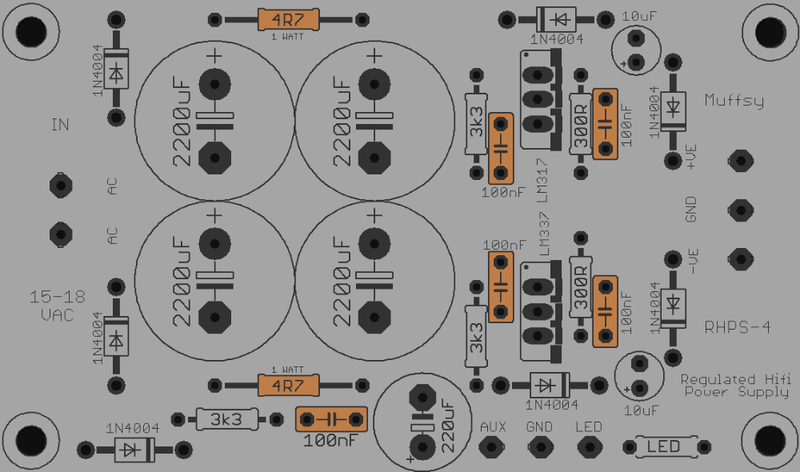 Before you move on, you might want to have a look at how to modify the Muffsy Hifi Dual Power Supply and its AUX Power, so you can get the component values you need. There are seven 1N4004 diodes on the board. They have to be oriented correctly. 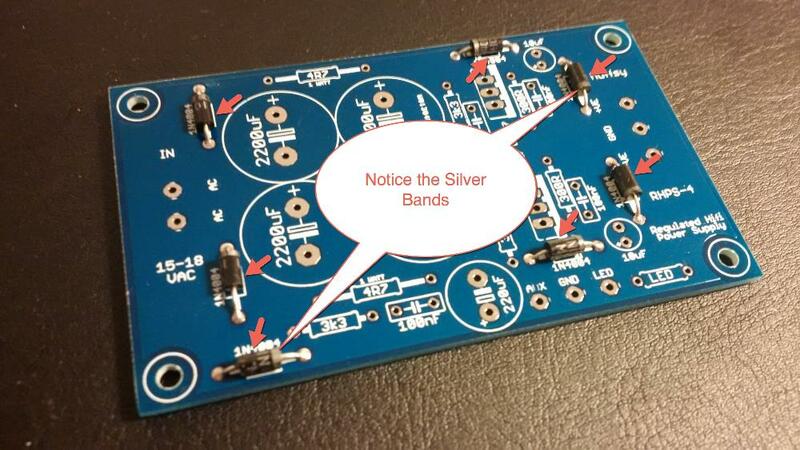 The silver band on each diode matches the symbol on the printed circuit board. 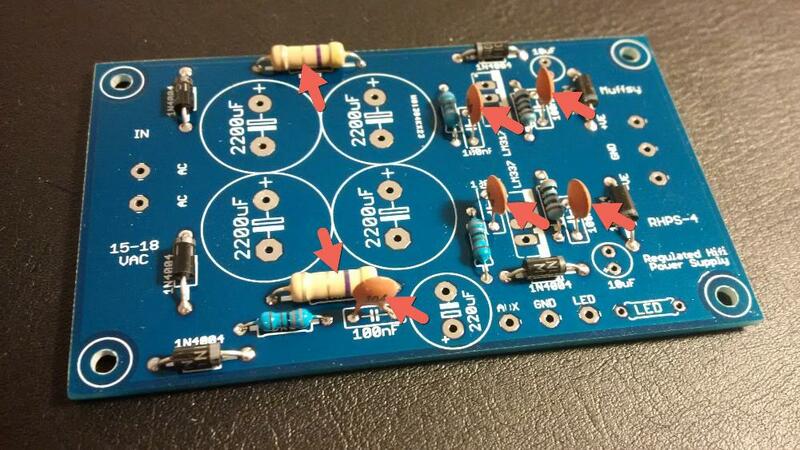 There are five of the 0.25W resistors, they can be oriented whichever way you want. It is a good idea to measure them before they are soldered in place. If you need the exact same positive and negative output voltage, you should match the four resistors on the right side of the board. If you don't, the voltages will only differ by 20-30 mV maximum. The two 1W resistors and the five ceramic capacitors can be mounted either way. I like to mount the capacitors so the text can be seen. There are two of these small electrolytic capacitors. 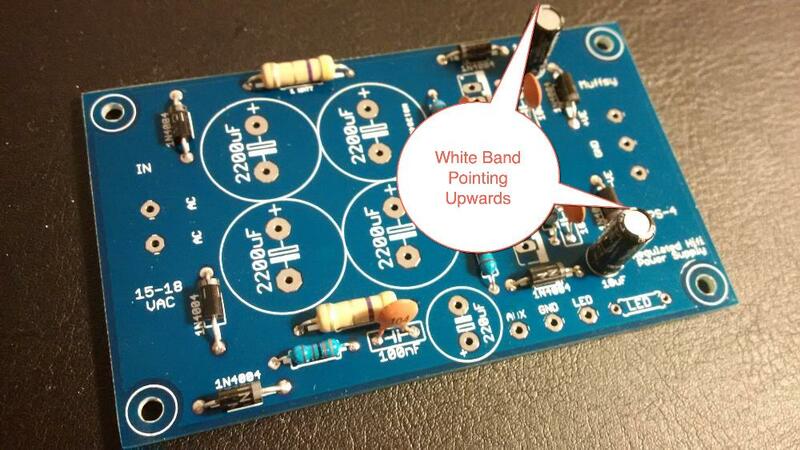 Make sure that the white band (negative) is pointing upwards when the board is oriented as on the pictures. There are two voltage regulators. One positive and one negative. The positive is the uppermost one on the pictures, the negative is the lower one. Make sure that the regulators are mounted the right way. The metal "backside" must point to the right, when the board is oriented as on the pictures below. If they are placed wrong, the power supply will not work at all. 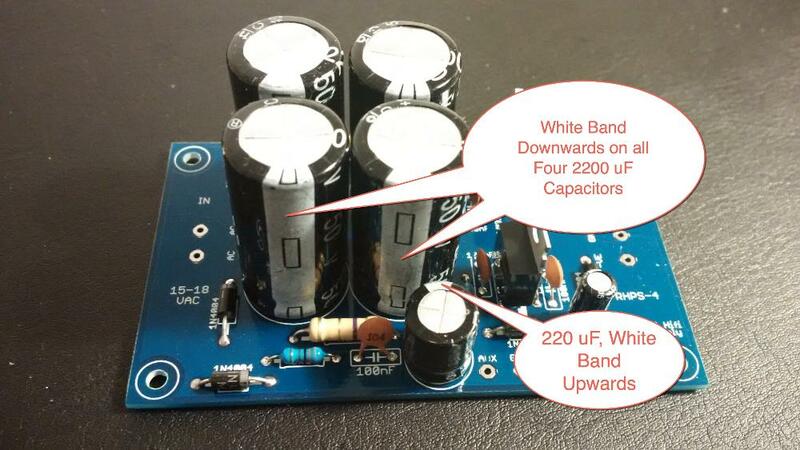 The smaller 220 uF capacitor must be oriented with the white band pointing upwards. 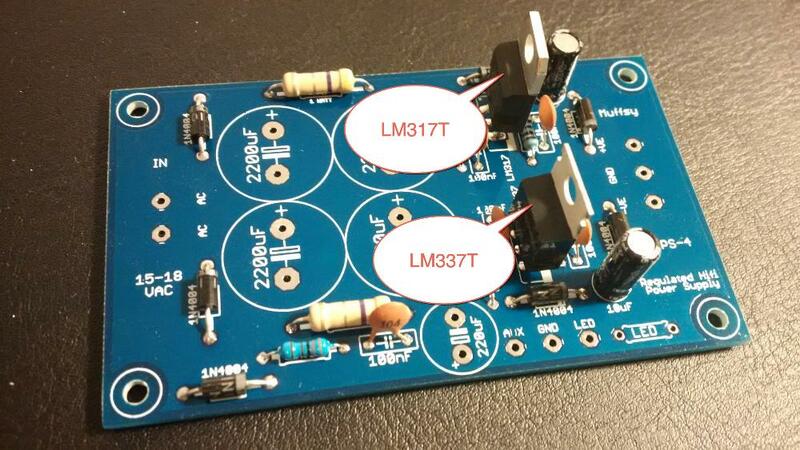 If you have decided to improve the voltage ripple, substitute this capacitor with the new one. 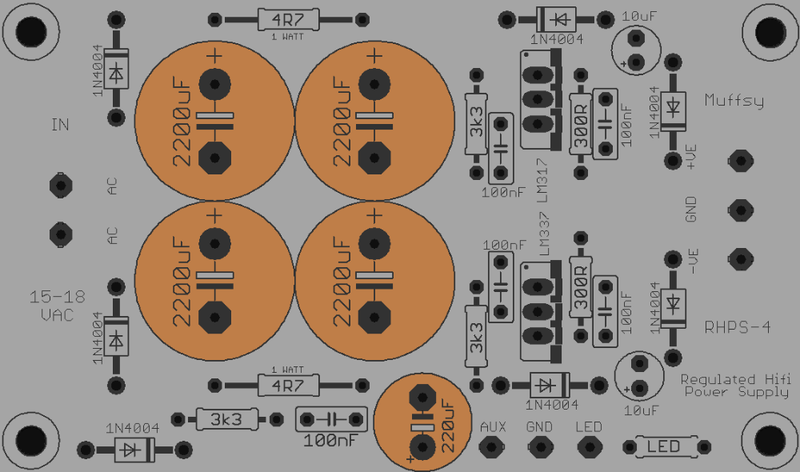 The four larger 2200 uF capacitors must have the white band pointing downwards. The last components to go on the board are the two screw terminals. B0905 Cabinet: If you are using a B0905 cabinet, you really want the holes of the screw terminals pointing inwards. If you don't, you risk shorting the power cables against the wall of the cabinet.